If you’re tired of pumpkin cheesecake and are looking for another type of cheesecake that is perfect for fall, you’ll have to try this maple cheesecake! 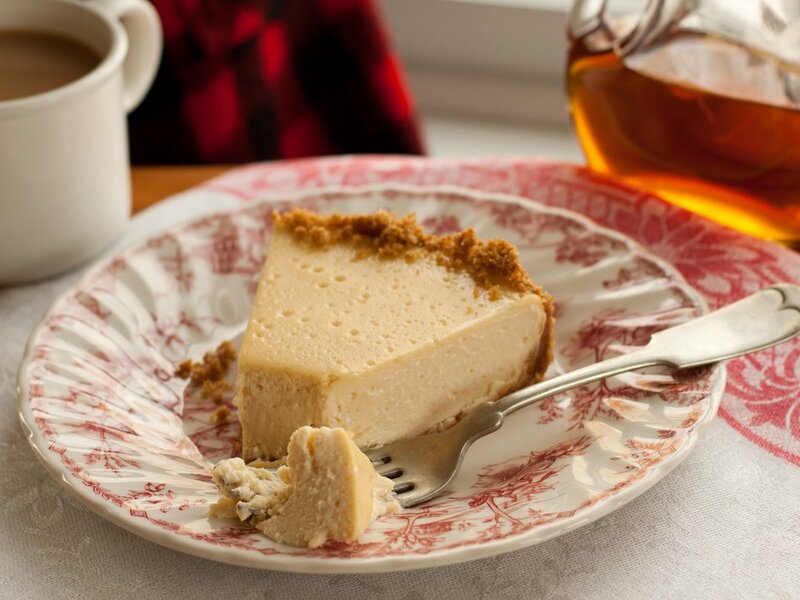 While maple can sometimes be overpowering, there’s no need to fear that here, as this recipe has a beautifully delicate maple flavor, while delivering the creamy, rich goodness you expect in a cheesecake. Feel free to share this recipe with friends and family on Facebook, Pinterest, Instagram, and Twitter once you’ve made it. Cheesecakes are easy to make and are perfect for making ahead of time since they freeze well. You just need to defrost the cake in the refrigerator for 24 hours and then it will be ready to serve. If you won’t be freezing it and plan to serve it soon after making it, just be sure that you give it enough time to chill (covered) in the refrigerator for at least 4 hours, but preferably overnight. For this maple cheesecake recipe, you only need 6 ingredients: graham crackers, Cabot Salted Butter, granulated maple sugar (though white sugar can be substituted), Cabot Premium Cream Cheese, eggs, and Vermont Grade A Dark Amber maple syrup. That’s it! To make this 12 serving cheesecake, follow the instructions as listed in the recipe below. While cheesecakes are fairly straightforward to make, the trickiest part is getting the cooking time right. The key is to not overbake it, as this will result in a less creamy cheesecake. It should come out of the oven when it is nearly set all the way to the center. This means that the center may appear as though it is not fully cooked, but it will be. You just need to trust that it is, pull it out of the oven, and transfer it to a wire rack to cool! Craving another rich cheesecake? Our Vanilla Bean Cheesecake recipe is a healthier version of the classic cheesecake, made with Cabot Lowfat Greek Yogurt and Cabot Cream Cheese. As a cooperative of over 800 farm families, our mission is to make the highest quality and best tasting dairy products you’ll find. We’d love for you to rate and review this maple cheesecake recipe once you’ve given it a try! PREHEAT oven to 350ºF. Wrap bottom and sides of 9- or 10-inch springform pan with aluminum foil (to prevent leakage while baking). PLACE graham crackers in 1-gallon zip-close bag; crush into fine crumbs with rolling pin or heavy pan (you will have about 1 &frac13; cups). Combine in bowl with butter and sugar, stirring until well blended. PRESS crumb mixture over bottom and partly up sides of pan. BAKE for 45 to 55 minutes or until set nearly all the way to center. Transfer to wire rack and let cool, then cover and refrigerate for 4 hours or overnight. 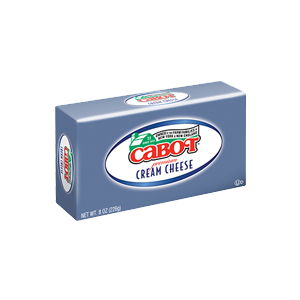 Recipe courtesy of the Couture Farm Family, Westfield, VT, one of the 1,000 farm families who own Cabot Creamery Co-operative. This is delicious, my favorite! Any tips on how to adjust baking time for a 6 inch pan/recipe? * This would likely take at least 20 minutes longer cooking. We have not tested in a 6" pan and will be interested in your results. This was my birthday "cake" last year; even my husband who's not a fan of cheesecake loved it! When it came time for our youngest granddaughter's birthday, she requested that her mom (our youngest daughter) make this for HER special day......again, success all around! Rather than the usual birthday cake, I made THIS for my birthday treat; even my husband who usually doesn&amp;#039;t care for cheesecake loved this. In addition, one of our daughters made this for her daughter/our granddaughter&amp;#039;s birthday ~ thumbs up all around! Thanks, Cabot!!! To the Filling I added: 1/2 Cup of Heavy Whipping Cream, 2 Teaspoons Pure Vanilla Extract, 1/4 Cup of Dark Brown Sugar and 1/2 Teaspoon Pure Maple Extract. It came out amazing! One of the best cheesecakes I've ever had. Delicious and not as sweet as it sounds. Amazing!